Dinner: an order of chicken fingers, with an order of sweet and sour chicken, a container of fried rice, 4 fortune cookies and a diet Coke? If so, let me assure you, you’re NOT alone! The main reason most people abandon any diet (and Nutritionists don’t like to use the word “diet”) is because they restrict too many foods, and end up overly hungry and feeling deprived. Successful weight loss means not only losing weight, but also keeping it off, and that means making changes that you can live with for the rest of your life. Most people know that to lose weight, you have to eat less, but those of us who have tried it, also know that’s easier said than done. 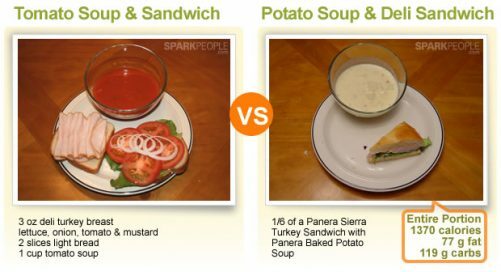 Eating low calorie foods or smaller portions helps, but what can you do when you eat less and are hungry as a result? Instead of over feeding yourself later in the day, try to volumize your meals and snacks. 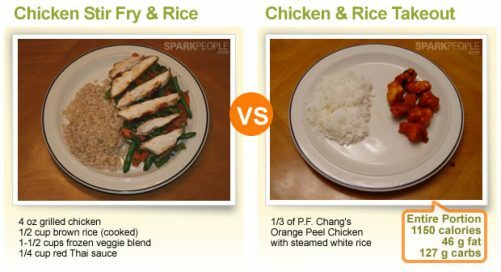 Each of these meals has between 300 and 400 calories. 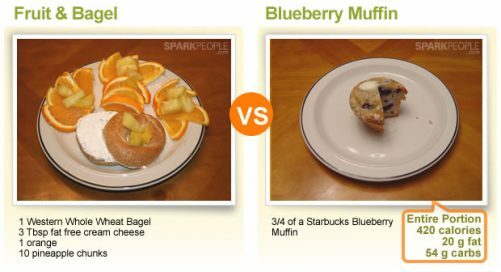 The difference is that the ones on the left are prepared without added fats and sugar. Instead, their calories come from ample portions of lean proteins, lots of fruits or vegetables on the side, and high fiber, stomach-filling, whole grains. Spread them out evenly throughout the day, add 2 healthy snacks in between, and it’s easy to see, with some creative planning, and healthy ingredients on hand, it is possible to eat well, feel full, and still lose weight! Do you have any creative ideas for volumized meals or snacks? If so, I’d love to hear them! Thanks! I’ve been a contributing blogger for my work for a while, but this is my first stab at it on my own. Thanks for reading!